Destination Baking Company - your source for quality bakegoods. Welcome to our Website! We thank you for your visit and look forward to serving you! 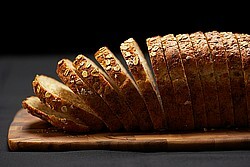 We are a small retail bakery in Glen Park Village open daily serving fresh and temptingly tasty baked goods. Everything we offer is made from scratch, by hand, thanks to our amazing staff. We love using the freshest produce in the market to create delicious taste treats. Come see what we have on offer for you today. Fall is here! Stop by and try some of our annual autumn treats! Our pumpkin walnut muffins are back. Also in the pumpkin family are the Frosted Ginger Pumpkin Cookies. And finally our mini Pecan Tassies are the perfect little taste treat...just about the best way to eat pecans! We are now taking orders for Thanksgiving Pies. Place your order by Nov 18th. Monday - Friday 6:30 - 6:30 p.m.
Saturday - Sunday 7:00 - 4:00 p.m.